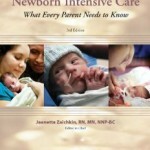 A great resource for families of premature babies in the NICU. This app comes from the same team (two mothers of premature babies and a neonatologist) who wrote the highly praised book Preemies: The Essential Guide for Parent of Premature Babies. Its features include A Pocket Guide to Preemies, A Remember to Ask List, A Remember to Do List, A Diary, A Trackers section, and a Treasured Mementos section. 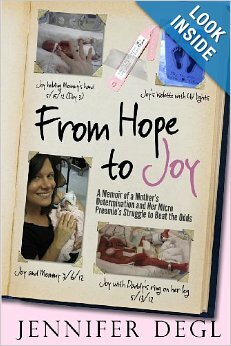 Jennifer Degl brings her readers on an emotional roller coaster: from the decision to get pregnant despite warnings from her doctors—and nearly dying four times during her pregnancy—to the birth of her daughter, Joy, seventeen weeks early, and this tiny baby’s fight to survive. The Degl family’s journey sheds light on the many challenges families face with a life-threatening pregnancy and birth, the hospitalization of an extremely premature newborn in the NICU, and the struggle to maintain normalcy for siblings at home. 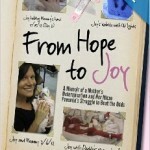 It is a riveting story to which many NICU parents can relate, especially parents of micropreemies. A great parent reference resource, which has been updated from their 2000 edition to reflect advances in neonatology. 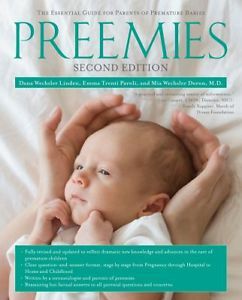 Authors Dana Wechsler Linden and Emma Trenti Paroli are parents who have “been there.” Together with neonatologist Mia Wechsler Doron, M.D., they answer the dozens of questions that parents will have at every stage—from high-risk pregnancy through preemie hospitalization, to homecoming and the preschool years. 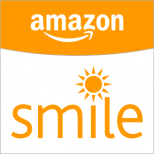 By Kimberly A. Powell and Kim Wilson (Editors) and foreword by Jeffrey Thompson, M.D. Twenty-two engrossing stories of babies born prematurely, written by their parents. In painstaking and heartfelt detail, these parents share their fears, their joys, the stories of where they turned for help, their tips, and most importantly, their triumphs. Information and support for parents of babies in the NICU. Please visit Dr. Dyer’s website to download this FREE ebook. Free text messages on topics such as prenatal care, baby health, parenting and more — support throughout your pregnancy and your baby’s first year. Learn more about Text4Baby at https://text4baby.org/. An online database of volunteer opportunities for when you need help or you want to provide help to someone in need in your community. This is a great resource to help out families in the NICU — you can coordinate volunteers for meal deliveries, car rides for siblings and more. Learn more about Lotsa Helping Hands at http://www.lotsahelpinghands.com/. Free patient blogs that connect friends and family during a health challenge. A great resource for NICU parents who want to keep family and friends updated on their baby’s progress without having to make multiple telephone calls. Learn more about CarePages at https://www.carepages.com/. PreemieBabies101 is Hand to Hold’s parent blog inspired by the many diverse experiences that are common to parents who have a preemie and spent time in the NICU, have a special needs child or have experienced a loss. Learn more about Preemie Babies 101 at http://www.preemiebabies101.com/. The Hydrocephalus Association provides support, education and advocacy for people whose lives have been touched by hydrocephalus and the professionals who work with them. Learn more about the Hydrocephalus Association at http://www.hydroassoc.org/. A great resource of information and support for people whose lives have been affected by HELLP Syndrome, preeclampsia and eclampsia– mothers, babies, fathers and their families. Learn more about the Preeclampsia Foundation at http://www.preeclampsia.org/. Not all babies grow and develop at the same rate, especially premature babies. 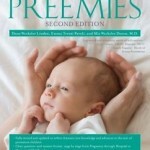 Helpful information on preemie milestones can be found on HealthyChildren.org at http://www.healthychildren.org/English/ages-stages/baby/preemie/pages/Preemie-Milestones.aspx and on Babycenter.com at http://www.babycenter.com/404_when-will-my-premature-baby-reach-development-milestones_10304028.bc. 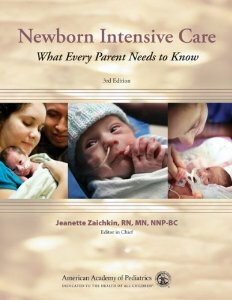 Significantly revised and updated, the new third edition of the best-selling Newborn Intensive Care: What Every Parent Needs to Know is a great resource for any parent with a premature infant. The book covers everything from how to overcome barriers to NICU parenting to how to prepare for and nurture your NICU graduate at home. The Lahav Lab is dedicated to performing clinical research to help improve the quality of life of infants and young children. Their work is focused on developing ways to optimize brain development and long-term outcomes of extremely premature infants in the NICU. They develop innovative bedside solutions with the hope of making significant impacts on perinatal and neonatal care. Hailey’s Hope Foundation is proud to help fund clinical research at The Lahav Lab. Learn more about The Lahav Lab at http://lahav-lab.bwh.harvard.edu/. RSV is a contagious viral disease that may infect a person’s lungs and breathing passages. In premature infants, severe RSV disease can lead to serious lung infection and hospitalization. Learn more about RSV at https://www.rsvprotection.com/. Though not a vaccine, Synagis [si-nah-jis] is an FDA-approved prescription injection of antibodies that is given monthly to help protect high-risk infants, including preemies, from severe RSV disease throughout the RSV season. Learn more about Synagis at https://www.synagis.com/. WebMD.com offers comprehensive coverage about how premature infants are cared for, what complications may arise, what to expect later in life, and more. Learn more about WebMD at http://www.webmd.com/parenting/baby/premature-infants-preemies-directory. A parenting website backed by over 60,000 American Academy of Pediatrics member physicians offering up-to-the-minute health advice for parents and caregivers. Learn more about HealthyChildren.org at http://www.healthychildren.org/english/Pages/default.aspx. Dr. Lin-Lin Remenar, a pediatrician with Crystal Run Healthcare in Wallkill, New York, knows personally and professionally the benefits of kangaroo care. It benefitted her daughter born at 32 weeks gestation. Read the full article at http://www.recordonline.com/apps/pbcs.dll/article?AID=/20110525/HEALTH/105250307.